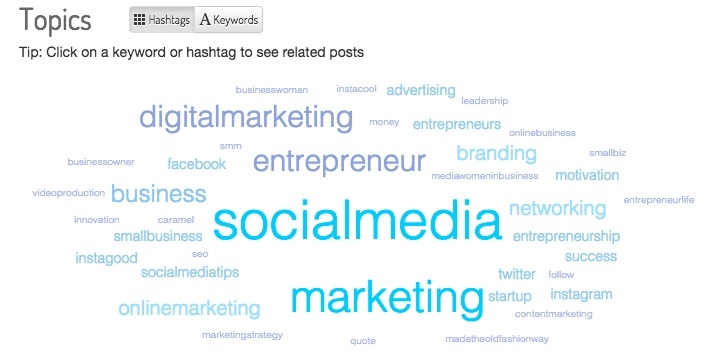 Do you struggle to find the right hashtags for your social media posts? Or, are you in a Hashtag rut and tired of always using the same hashtags with little or no results? So before you freak out and wonder how you’re going to follow all the guidelines AND come up with 30 hashtags, here’s five tools you can use to help you with your hashtag research to discover the perfect hashtags to use and get out of your hashtag rut. Iconosquare is a free tool to monitor Instagram statistics, but it’s also useful for hashtag research. Simply type the hashtag you want to use into the search field at the top of the home page and then you’ll get a list of results showing Instagram accounts that contain the searched word and also the top hashtags related to your original search term. Then click on any of the hashtags and see the most recent posts that use those hashtags. If you click on any of those posts you can see what other hashtags those accounts are using and get some ideas of other relevant hashtags you could use in your posts. Tip: Choose an image that has a lot of likes and/or comments, because you know that they’re probably doing something right! You can also click on any of the profiles listed and see their most recent posts. Follow this up by clicking on that profile’s most popular posts and see which hashtags have been used. 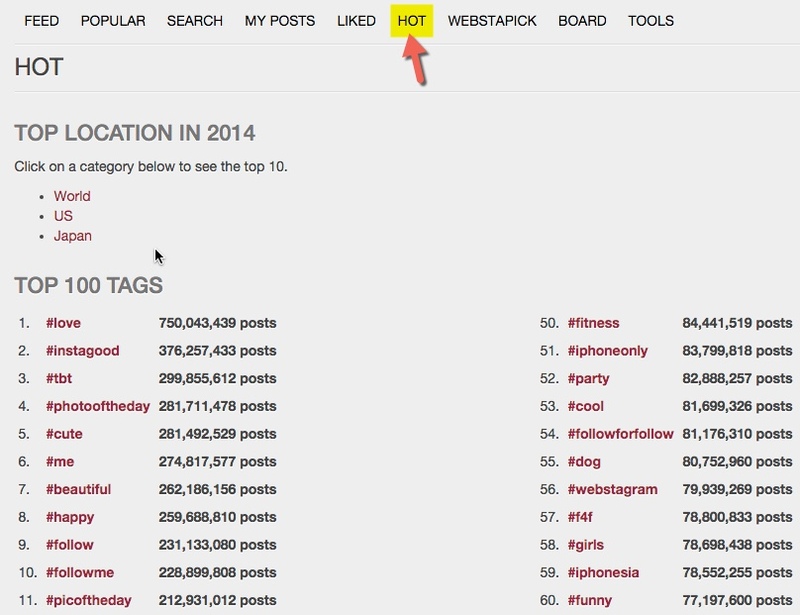 Webstagram is similar to Iconosquare, in that you are able to search by a particular hashtag. You’ll then see the top accounts and hashtags related to the searched hashtag. 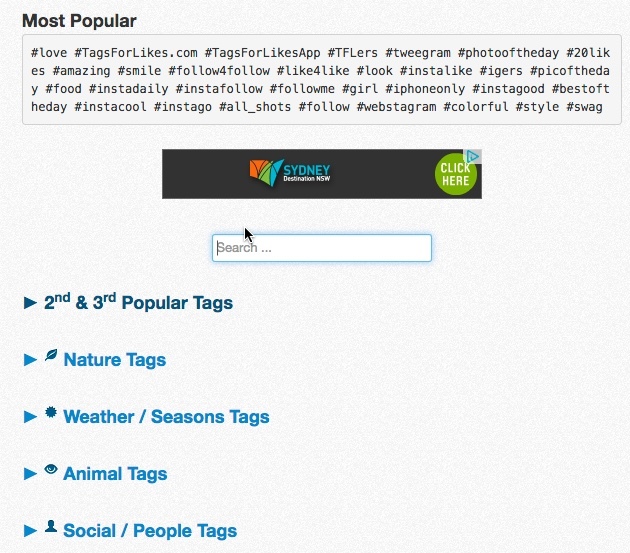 It also gives you insight into how popular a hashtag is as it lists the number of posts that use that hashtag. 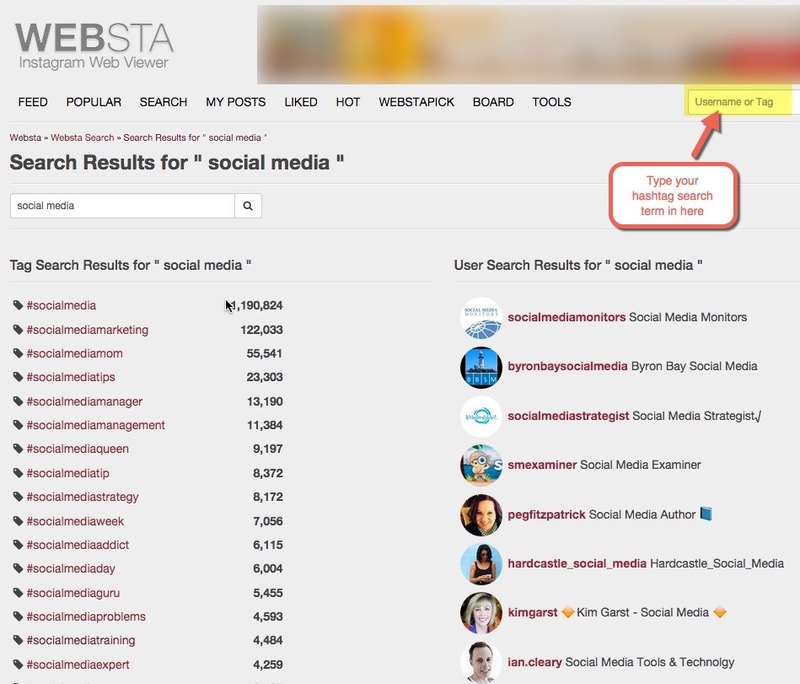 Webstagram also has some additional features that allow you to find the most popular hashtags and accounts. Click on ‘Hot’ in the top menu and it will show you the Top 100 most popular hashtags, along with the top 100 Instagrammers in terms of Followed and Following. You may want to consider using some of these popular hashtags in your posts to try and get some more visibility in the Instagram ‘Search and Explore’ page. However, just be aware that if you are using these hashtags then you may not be connecting with people that are in your tribe, and you could end up with some ‘fake’ followers. Tip: Beware of where it shows you the accounts that are Following the most accounts as I suspect most of them are spam accounts. 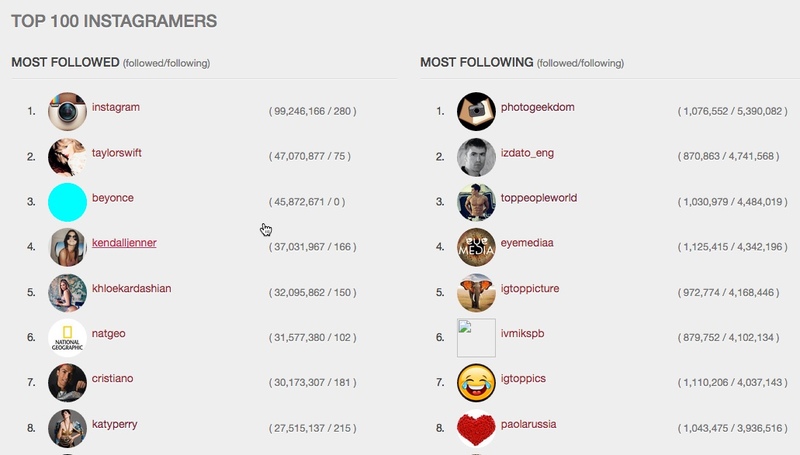 (Notice that the most ‘Followed’ accounts don’t actually follow many other accounts. If an account is following a lot more accounts than it has followers then it’s often an indication that there’s something not quite right). 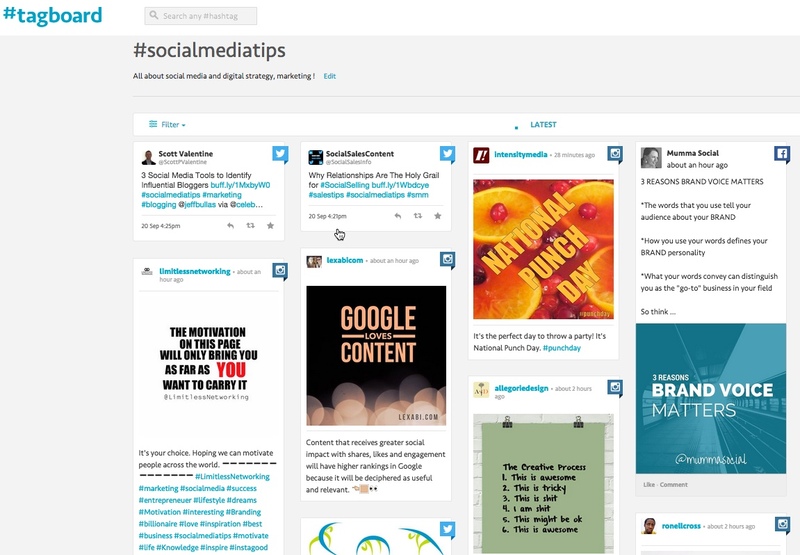 Tagboard is a great tool for displaying all the content using a certain hashtag across all social media platforms. To use Tagboard, type in the hashtag that you’re interested in and it will show you the most recent/top posts across Instagram, Twitter, Facebook, Google+, Vine and Flickr. You can then filter it to show you only posts from Instagram, or whatever platform you’re interested in. 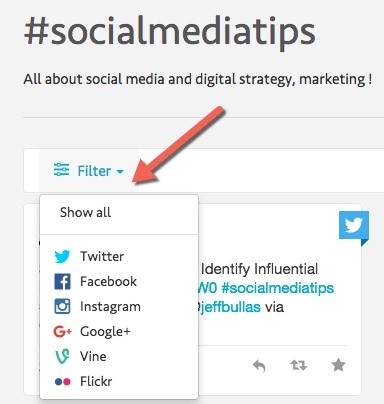 Tip: Use Tagboard to look at the other hashtags that the popular images and accounts are using, and start using them in your posts. Keyhole is a high-cost enterprise-level tool that can be used to track large social campaigns, identify key customers and influencers and share reports. However, it does have a really cool feature that you can access for free. Simply go the home page, search on a hashtag, then scroll to the bottom of the report to the ‘Topics’ section. You’ll then see a word cloud based on the hashtag you searched, which gives you more ideas for hashtags that you can be using with your posts. Tip: Sign up for a free 3-day trial to access real-time data and do lots of searches in those 3 days! TagsForLikes is a collection of the most popular hashtags used on Instagram collated into various categories. It’s available on the web and in the AppStore and Google Play. Each category contains up to 30 of the most popular hashtags, so that you can copy and paste the hashtags straight into your Instagram posts (you’re allowed up to 30 hashtags per Instagram post). Depending on what industry you’re in there are some great hashtag ideas to be found! Tip: Tag For Likes may be useful in gaining followers and visibility for your account, however use with caution. If you are using Instagram for a specific business reason you want to be targeting potential followers who are interested in what you do. You now have five places you can go if you need to research new hashtags to use in your Instagram posts or if you want to find content related to a particular hashtag. 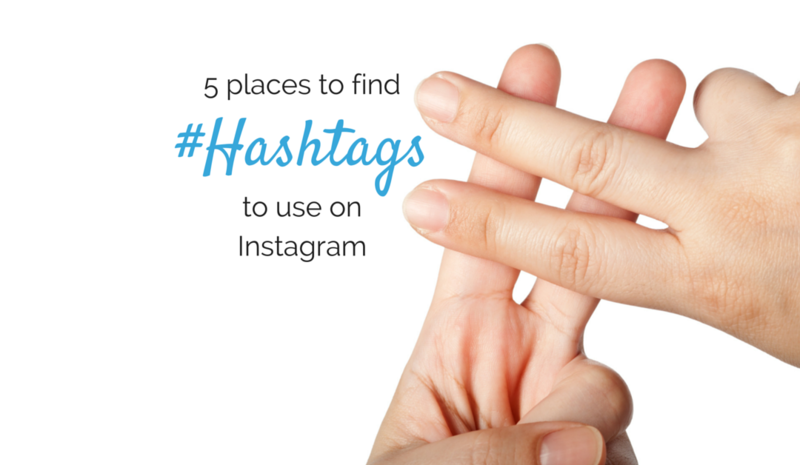 Do you use any other tools to find good hashtags to use on Instagram? If so, let us know in the comments below. Super post! I would add one more — hashtagify.me is a wonderful place to research related hashtags, too. Thanks for the tip Laura. I’ll go check it out. Thank you for this, it’s so useful! I’m just starting out with Instagram and liking it so far. I’m definitely going to try out some of these tools. So far I’m already really liking tagboard!